Billdu is a cloud-based invoicing system designed for freelancers and small businesses which can be used to create and issue invoices, manage online stores, track expenses, capture customer feedback, and more. Billdu enables users to create and customize invoices, with options to add logos, signatures, and QR codes, as well as including an email address for PayPal payments. Customers can save invoices that are sent to them, and users can choose to invite customers to rate products or services when they receive their invoice. For online stores, invoices can be generated automatically when a customer places their order, and sent via email or downloaded directly from the online store. Orders are imported into Billdu automatically, where they can be edited or have their statuses updated when they are processed, and users can track shipped order and receive notifications of the locations of goods. Billdu can be used to generate invoices for multiple companies on a single account, with an option for multi-user access. Costs and received invoices can be managed, with automatic entry of recurring costs, and users can scan receipts for expense tracking using the mobile app. Billdu also includes a number of built-in reminder templates for use in chasing up non-payers. Users can also create and issue invoices through Billdu’s native iOS and Android apps, even when they have no internet connection, with all data being stored on the phone until it can be synchronized once connection is restored. nothing yet (although i miss uploading normal docs and mutations for my accountant). and maybe a small message i can sent every quarter to my accountant, like; all docs and calculations are done. I'm satisfied with Billdu. Since I started using it, my invoices look far more professional, which was already couple of times mentioned by my clients. I like invoice customization, changing colors, adding signature on mobile device, adding the logo ... Reports helped me to organize and get a better overview of my incomes vs expenses. Very useful is providing access to my accountant that helped me to cut loads of unnecessary work. I like invoice customization, changing colors, adding signature on mobile device, adding the logo ... Reports helped me to organize and get a better overview of my incomes vs expenses. Very useful is providing access to my accountant that helped me to cut loads of unnecessary work. I have kept my booking WAY more organized since using Billdu! I love that it keeps track of my sales tax and it makes doing taxes a breeze!It's very easy to use! Extremely user friendly! It's very easy to use! Extremely user friendly! So far there hasn't been anything I don't think! a cloud-based invoicing system designed for freelancers and small businesses which can be used to create and issue invoices, manage online stores, track expenses, capture customer feedback. a little pricey for me but needed it anyways. app seems to have some bugs but cant get support to help. Users can add logos, signatures, QR codes, and PayPal email addresses to invoices, and customers can save their invoices. 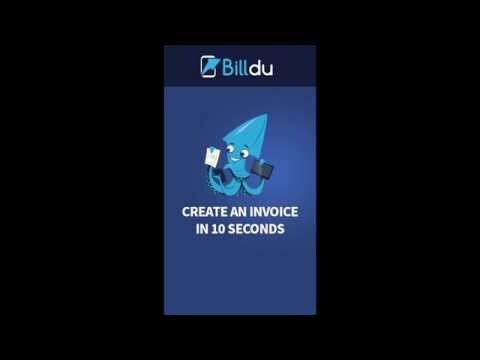 Invoices can be created and issued through Billdu's native mobile apps even when there is no internet connection, as data is stored on the phone and then synchronized when a connection becomes available. Receipts can be scanned into the app and saved, with costs registered in the application. Billdu can be used to manage eCommerce stores, with automated invoicing of customers when an order is placed, order editing and management from within Billdu itself, and tracking of shipped orders with location notifications. Multiple companies’ invoicing needs can be managed from a single Billdu account. Below are some frequently asked questions for Billdu. Q. What type of pricing plans does Billdu offer? Q. Who are the typical users of Billdu? Q. What languages does Billdu support? Q. Does Billdu support mobile devices? Q. Does Billdu offer an API? Yes, Billdu has an API available for use. Q. What other apps does Billdu integrate with? Q. What level of support does Billdu offer?